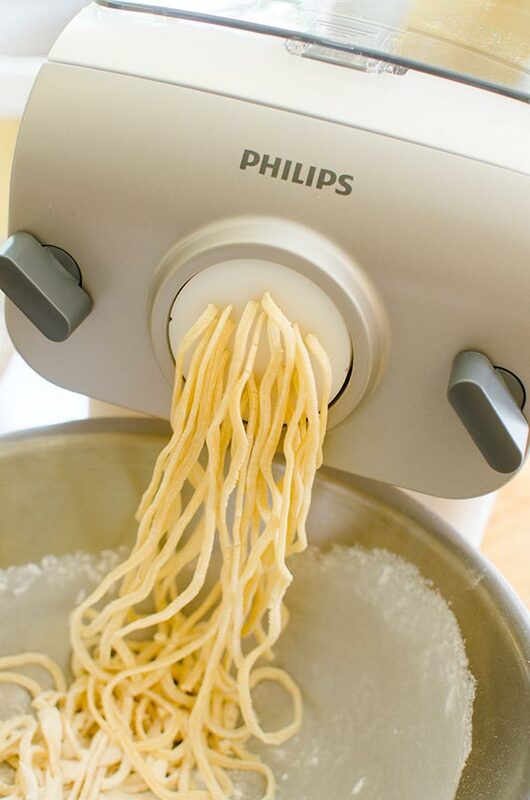 Homemade pasta is possible in just 15-minutes with the Philips Pasta Maker. 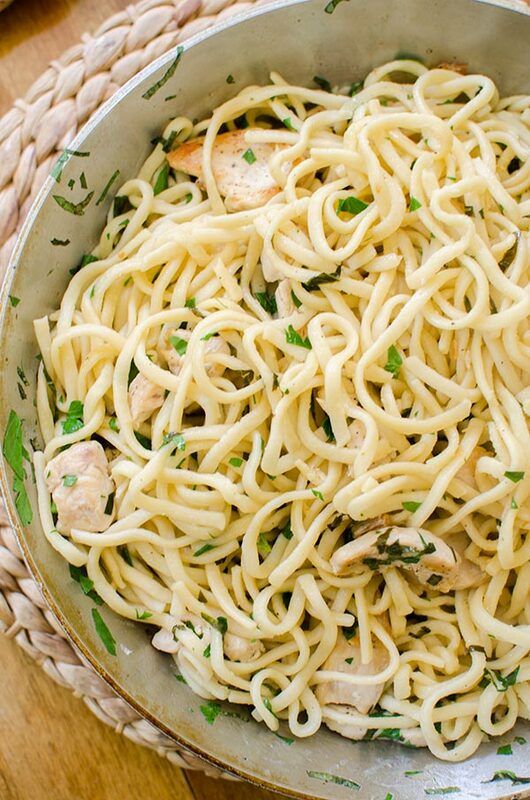 Try this quick recipe for pasta with chicken and fresh herbs! Last summer, I headed to the Amalfi Coast with my sister, and other than the beautiful views and charming coastal towns, I was most excited about homemade, fresh pasta. It’s synonymous with Italy, is it not? This was my first time in Italy and I knew that I would be eating 99% pasta and I was 100% ready for it. Homemade pasta is something I’ve dabbled in over the years, and I think most foodies or passionate home cooks would say the same. The first time I made homemade pasta was when I was about twelve years old. We rolled the pasta by hand and made these little rustic pieces, and it took forever. After that first foray into homemade pasta, I’ve continued to play around with it, but it always just ended up being too much work. Then I tried the Philips Pasta Maker and now all of my homemade pasta dreams are a reality. I am so excited about this appliance. It makes one pound of pasta in 15 minutes. Literally. It’s basically any pasta-lover’s dream because there are endless, customizable pasta-making possibilities. I’ve been playing around with this machine for the past couple of weeks, and I am completely smitten. You could say that I’ve reverted to my Italy-vacation vibes and consuming 99% pasta. What I love about the Pasta Maker is that it makes pasta in the amount of time it takes to boil your water and prep your ingredients. 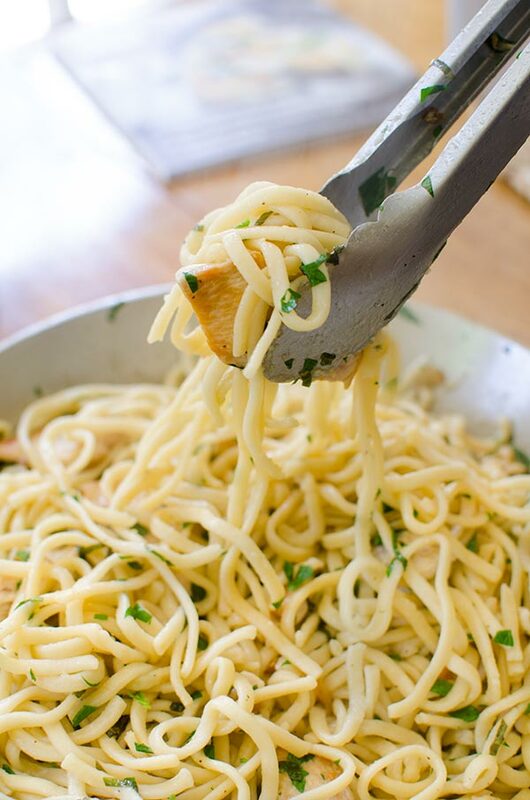 (Especially for this incredibly quick and easy pasta with chicken, fresh basil and parsley, if you’re wondering.) 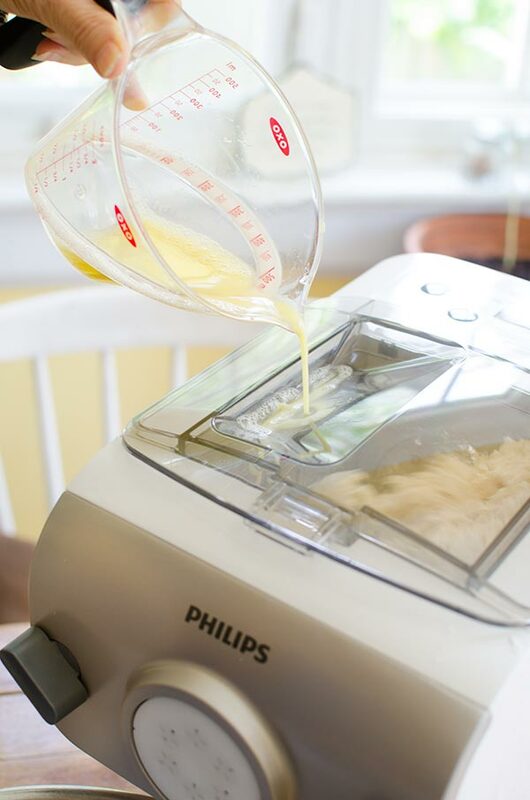 It begins with adding the flour to the machine, followed by the liquid (water + egg). Then all you do is choose your setting (there are two choices, pasta for 1-2 servings or 3-4 servings) and turn it on. Within three minutes, there will be noodles coming out of the machine! They come quickly, so I like to stand by with a pair of scissors to cut them to my desired length. It comes with all of the homemade pasta recipes you could dream of, be sure you have a scale because the recipes are measured in grams. For this recipe, I wanted to showcase the pasta with a light and fresh recipe highlighting my favourite summer ingredient–fresh herbs! I was inspired by a bunch of basil and fresh parsley I had in my fridge. With some chicken, a little garlic and Parmesan cheese, you have the easiest dinner on the planet. I know, ‘homemade pasta’ and ‘the easiest dinner on the planet’ don’t usually go together but in this case they do! This machine truly makes homemade pasta something that can be done on a weeknight, and trust me, I know how tired you can be after a 10-hour day at work. Open lid and add flour. Close lid and turn on appliance. Select program 2 and press start. Once machine is running, slowly pour in liquid through opening on lid. Pasta will appear after approximately 3 minutes. Cut into desired length and toss with a small amount of flour. Cook in a large pot of salted water for 4-5 minutes. Reserve 1 cup of pasta cooking water before draining. Meanwhile, heat a large sauté pan over medium heat. Add 2 tbsp of olive oil. Season chicken with salt and cook for 3-4 minutes per side. Set aside. Add remaining 2 tbsp of olive oil and garlic, cook for 30-seconds to 1-minute. Add pasta, cooking water, fresh herbs, Parmesan cheese and lemon juice . Toss to coat, serve with freshly cracked pepper and additional cheese. Disclosure: This post was sponsored by Philips – as always, all opinions are my own. Thank you for supporting my sponsors and allowing me to continue creating recipes like this pasta with chicken and fresh herbs. This Philips Pasta Maker sounds wonderful! I can see why you love it & I'm sure many will buy one because of your excellent experience & I agree, home-made pasta is the greatest! I love your sauce recipe as well & I shall be making it tonight! Thanks, Living Lou, for all of your delicious, healthy, "easy-to-make" recipes! Thank you! Let me know how it goes, the Philips Pasta Maker does make it so simple! I love to make my own pasta! It's so good. This looks delicious!